Image caption The ambulance service said it is working to "make sure that the people of the north west get the service they need"
The North West Ambulance Service (NWAS) has been described as a "shambles" in Parliament and accused of putting lives at risk. Rochdale MP Tony Lloyd said he was "livid" about the treatment of an elderly woman in his constituency who waited eight hours for an ambulance. The Labour MP blamed A&E closures and inadequate staffing for the failings. 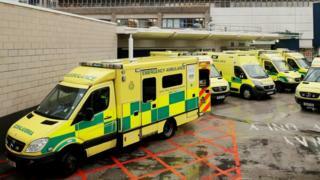 NWAS said its performance against national standards had "not been as good" as it would like. "We would like to assure the public that much is being done to improve this," the service said in a statement. Mr Lloyd said he had been contacted by Ron Gerber, who had to ring for an ambulance for his wife Pat at 21:00 GMT on 26 December. He said it was 05:00 before an ambulance arrived to take her to hospital. Mrs Gerber was due to move to a hospice on Monday but an ambulance set to pick her up at 11:00 did not arrive, Mr Lloyd added. The MP said NWAS is "putting people's lives at risk" and this is "simply unacceptable in modern Britain". The problems are "not part of the winter crisis" but reflect something "fundamentally wrong" with the system, he said. Image caption Tony Lloyd said the "sad reality" is that the service is a "shambles"
Mr Lloyd said there is a nationwide shortage of paramedics and that while demands in the highest category of calls in the North West of England had risen 50% over the past six years, the number of paramedics had only increased by 16%. "Staffing simply is not keeping pace with the change in demand". He also blamed the closure of A&E departments for the increased pressure which has resulted in skilled paramedics waiting outside hospitals "for hours on end." NWAS said it will be offering to meet with Mr Lloyd to discuss the issues he raised and is "confident" of improvements in the coming months. Health minister Stephen Barclay said there is an "issue" with performance and the service "need to improve". He said work is underway with the NHS to address this as part of wider national initiatives.